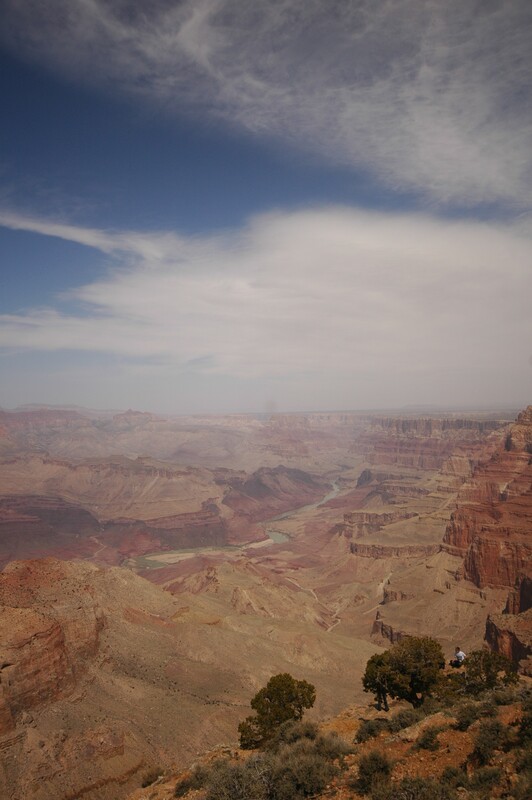 Li Xiaohu didn’t realise there’s a Grand Canyon East until we saw some pictures on the wall of Yavapai Lodge lobby. 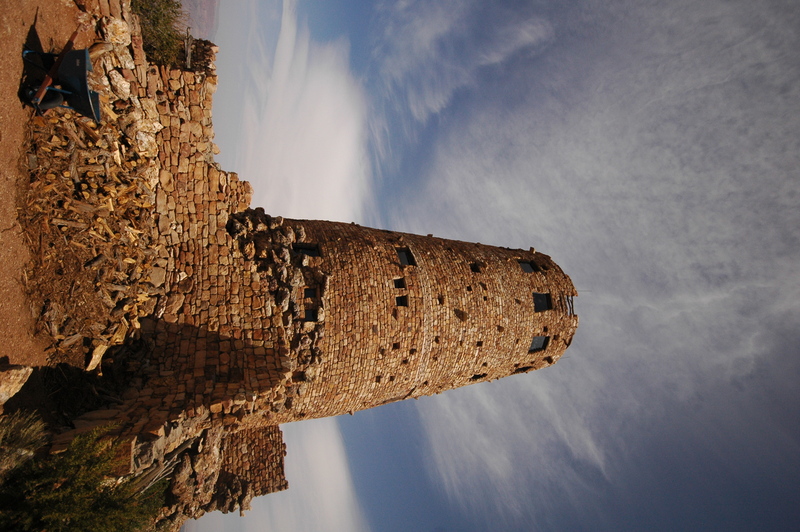 It is also called ‘Desert View’. The Colorado river in one picture attracted our attention. Then we decided to join the tour. 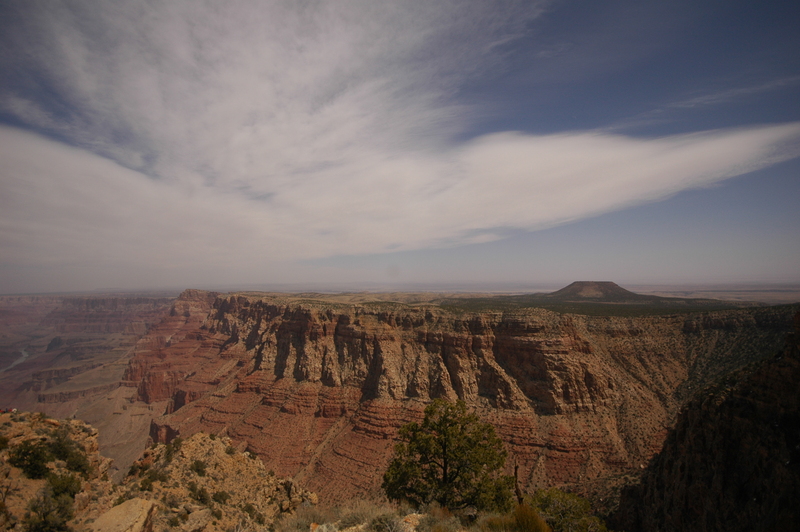 The old lady driver was very talkative and introduced the preservation of Grand Canyon all the time. She spoke with her old, raucous voice, which I like, hahaha. 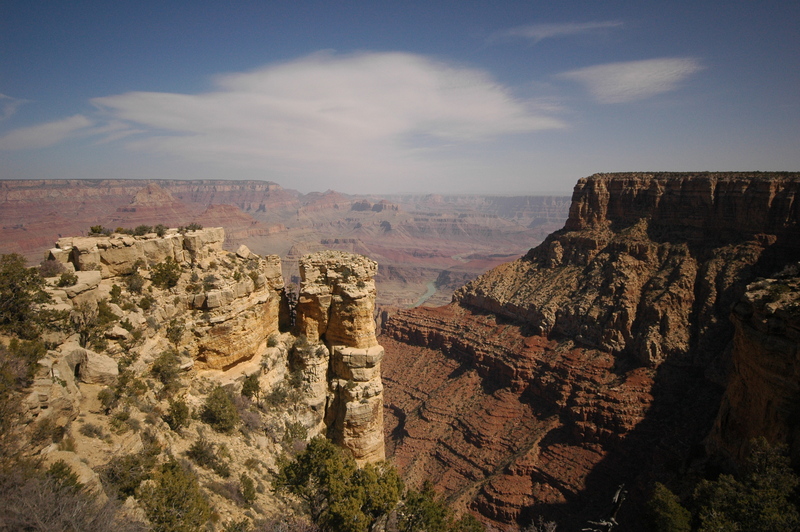 Along the East Rim Drive, we visited a few distant viewpoints such as Moran point and Yaki point. Fewer tourists had been here, I guessed. The emerald-green Colorado river was underneath the cliff. On the roadside, there were some pale or dark, dead wood? The old lady explained sometimes lightning hit trees here and burned them down……Wow, why I’m so looking forward to seeing lightning?? Not really interested in the souvenir shops inside the watchtower, we began to hike down from the East Rim to explore a little bit more. The hat-like mountain in the picture below was called ‘painted desert’. Frankly, their notion of desert is quite different. LoL. For me, ‘desert’ usually means a hot, barren place composed of sand only, as the Mongolia-China border, where a camel train carried us to a well for water. Here the rocky surface was also called ‘desert’, furthermore, ‘painted desert’ with green plants and layered rocks. We walked along the sandy and rocky path slowly. There were some short bushes. It was quiet around here. Rarely tourists came down, and we met 2 or 3 of them only. In the lowest place we could achieve, around 20 youngsters sat down and studied in a group. The tutor was reading their book out loud. Her ringing voice was sent by the blowing wind. A Geography class?? It was nice peaceful day. The sun was not as bright as in south rim. The river and valley far away looked like a red-style oil painting under the clouds, just like the oil painting we saw on the wall of Grand Canyon Railway Hotel. We couldn’t help but imagining a journey towards the river valley, on the back of a mule, and surrounded by red cliffs all the way. We sat down beside these young and quiet students, and enjoyed the scene and the peace. Nobody noticed the passing of time. 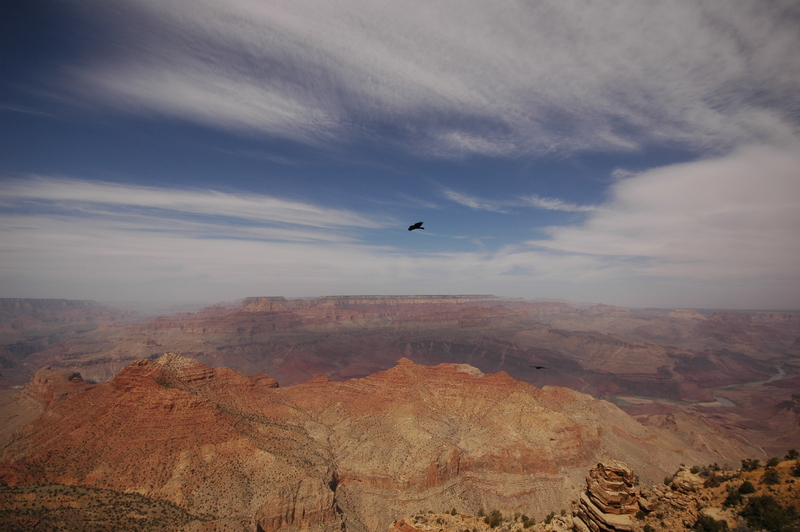 Eagles flew in the sky, making quick-moving shadows on the red mountain ridge. 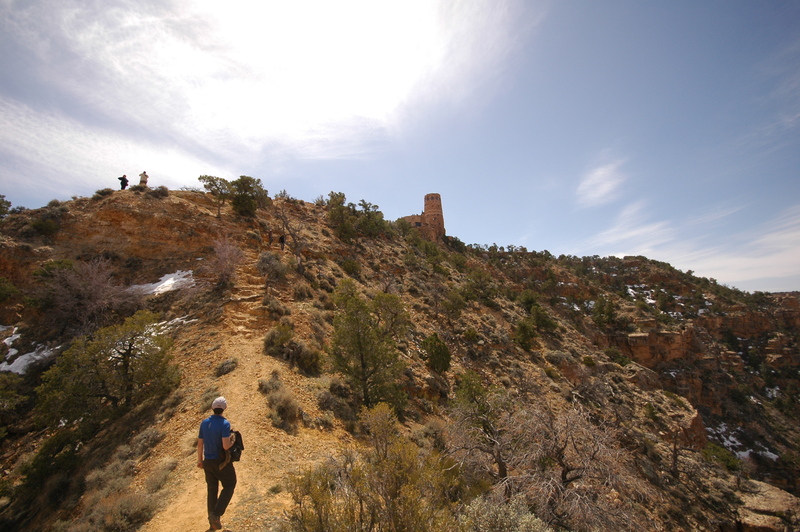 On the way back to the watch tower, we ended up with realizing how much we had hiked down. This side of mountain was steep. So that’s so-called ‘Trekking in the World’.